What a year it has been for Canadian triathletes. Many of the familiar names continued to wow us with their grit and tenacity, while others stepped up with breakout performances. Narrowing the year down to just ten standout performances has gotten the Triathlon Magazine Canada office buzzing with debate. After much back and forth, here are TMCs best Canadian performances of 2018. The 2018 season got off to a crazy start for Brown when she crashed at the first WTS race of the season in Abu Dhabi and fractured her shoulder. With a month to go before the Commonwealth Games, she buckled down and somehow managed to rehab the shoulder to the point where she could compete. And compete she did, becoming just the fourth Canadian triathlete to win a medal at the Commonwealth Games. Thanks to her run, Brown jumped onto the podium, taking the bronze medal behind Bermuda’s Flora Duffy and England’s Jessica Learmonth. Beals began the 2018 season with a string of Ironman 70.3 wins at events in Taiwan, Victoria (BC) and Maryland. But that early season success was only a taste of what was to come. On August 19th, in his Ironman debut, Beals dominated the professional field at Ironman Mont-Tremblant, which included Lionel Sanders. On the bike, Beals set a blistering pace, moving into the lead and putting pressure on Sanders and the rest of the field. On the run, he held his speed throughout and finished in 8:10:36– breaking the previous course record by six minutes. He also became the first Canadian male to win Ironman Mont-Tremblant. Six weeks later, Beals won the swim-cancelled Ironman Chattanooga in Tennessee. At just 21, Stefan Daniel has already made a name for himself on the world Paratriathlon stage. Now a three-time world champion, Daniel retained his number one position in the ranks thanks to another impressive world title in Australia at the Grand Final. Daniel capped off his 2018 season with a USports Cross Country title (National Championships) with the University of Calgary Dinos. Angela Naeth crosses the finish in eight position at the 2018 Ironman World Championship. Having been diagnosed with Lyme Disease in April, Angela Naeth nearly didn’t make it to Kailua-Kona, Hawaii. But, thanks to some podium results, Naeth was given a wildcard entry. Her eighth-place finish certainly justified her last-minute entry, an impressive result notwithstanding her circumstances and the field assembled at the Ironman World Championships this year. McMahon made the move to long course triathlons in 2013 with his debut race at Ironman 70.3 California. Since then, McMahon has become one of the top long course triathletes in the world, having broken the eight-hour mark five times. In his debut Ironman Canada, McMahon overcame the scorching temperatures to post an 8:31 and become the first Canadian male to win the race since Trevor Wurtele in 2013. McMahon took the lead from the start, and then made his race-winning move on the run. Canadian Jeff Symonds came in second, and Matt Russell was third. Two years ago, Tara Norton finished second at the Ultraman World Championship. Unknown at the time, she had a severe stress fracture in her femur. Then, just days after completing Ultraman, her femur snapped in two. After a full year of rehab, Norton returned to the Ultraman World Championship in 2018. Thankful just to be running again, Norton stayed steady throughout the three days of competition and was crowned world champion. Earlier this year, in preparation for the Ultraman World Championship, Norton also completed the Dóxa Threelay event, solo, becoming the first ever Dóxawoman. Bob Knuckey the 2018 M70-74 Ironman World Champion. Photo: Barrie Shepley. Four years ago, when Bob Knuckey competed at the Ironman World Championship, he finished the race in 12:01. In 2018, at the age of 70, Knuckey blasted through a 1:18:13 swim, followed that up with a 5:47:38 bike and then ran the marathon in 4:38:38. Despite a fall in the last 400 m that left his face bleeding as he crossed the line, Knuckey finished in 11:55:54, winning the M70-74 age group. In 1978, the winner of the first Ironman took 11:46 to complete the course. Forty years later, Knuckey was only 10 minutes behind the mark. When he crossed the line, the crowd roared once they heard he won in under 12 hours. 2018 was a breakout season for Tyler Mislawchuk on the International Triathlon Union circuit. At the highest level, the World Triathlon Series, Mislawchuk had a career-best finish of fourth at the WTS event in Yokohama, Japan. Then, a few weeks later, Mislawchuk captured the bronze medal at the World Cup event in Antwerp, Belgium. Thanks to a number of top ten results in the WTS, Mislawchuk finished ninth in the world rankings. Findlay wins Ironman 70.3 St. George (NorthAmerican Championship). Photo: Roka Sports (IG). Known to many for her short course success, Findlay has spent much of the 2018 season racing on the Ironman 70.3 circuit. After some “oh-so-close” results, Findlay got her big win at the North American Championship. Up against an impressive field, that included the fourth-place finisher at the 2018 Ironman World Championship, Sarah True, Findlay posted a 24:46 swim, 2:25:11 bike and 1:23:05 run to win Ironman 70.3 St. George (North American Championship). She would be joined on the podium by Jeanni Seymour and Sarah True. Lionel Sanders wins THE CHAMPIONSHIPS in Samorin, Slovakia. Photo: Talbot Cox. Unfortunately, due to Sanders’s poor showing at the Ironman World Championship, few remember his early season success. At The Championships (Challenge Samorin) in Slovakia, Sanders and Sebastian Kienle wowed the crowd with an epic duel on the bike and run. Sanders came out of the water a minute-thirty down on Kienle, but quickly went to work on the bike, joining Kienle later in the 90K ride. On the run, Kienle would try multiple attacks to shake Sanders, but he couldn’t get a gap. With 5K to go, it would be Sanders who attacked, and Kienle had no answer. Trying to highlight just ten performances is difficult, especially when Canada had so many great performances. Here are six performances that didn’t make the cut, but deserve recognition. Jen Annett set the bike course record (4:25:11) at Ironman Texas. The record is the fastest ever bike split by a woman at the Ironman distance (180K). 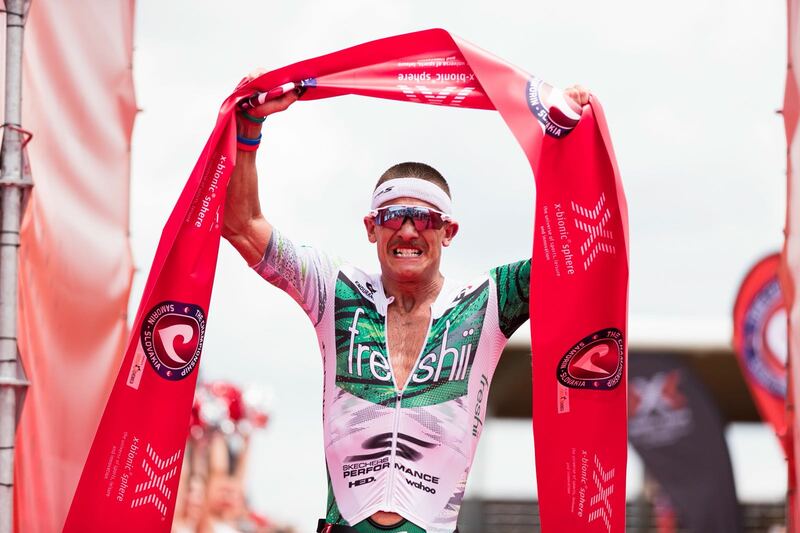 Jackson Laundry with his first professional Ironman 70.3 victory in Raleigh, North Carolina.